The Stardust was imploded at about 2:30am Vegas time. 2 much risk 4 u? This text from Sporting Index came alongside yet another promo that I must be able to find a way to exploit this weekend. Register for their mobile betting service, and they’ll cover net losses on sports up to £50, it says. Getting set up turned out not to be as easy as texting some word to some shortcode number, as part one of the text suggested. I’ve still had no response, so I’m not yet convinced this isn’t part of some kind of scam. I know it’s the law 2 make sum abbrvs 4 txt, but would you really expect the compulsory high risk warning that is required by FSA-regulated spread betting firms to look like this? PokerStars offered me a whopping 300 FPPs to complete a survey. That’s worth about 2 quid on Amazon (assuming I ever regain VIP status in order to cash them in) or it’s three fifths the price of a Chris Moneymaker poster. But why would I want to go and do a thing like that? I’m no expert on their range of posters, because I’m not 12 any more, so I don’t know which ones have proved popular. However I did notice that the Moneymaker medallion is the only one still available from the strictly limited edition set of three issued last year. Raymer and Hachem sold out a long time ago. 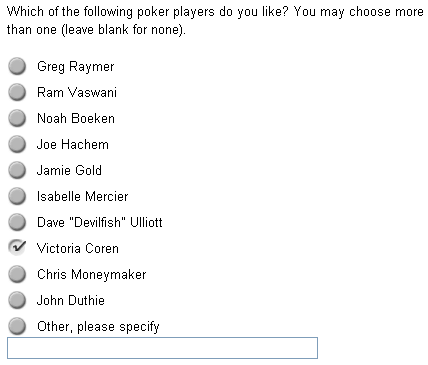 The survey seemed to be geared towards play money players, asking what kind of promotions I’d like to see in order to deposit and why I play for real money at other sites. Not sure why I got this – it’s not like I stopped playing there completely, and I still have a real money balance as well as T$ and W$ to spend. But it only took about a minute to whizz through the answers – all multiple choice – so worth checking your Stars account if you haven’t logged in lately. Roulette is not the most thrilling game anyway, but I can appreciate the recording of the £30 I bet with Sporting Index this weekend that didn’t actually cost me anything was pretty much at the bottom end of the excitement scale. Even for me, whose money was almost at risk. This one is slightly better. Ashley Revell bets his life savings on red. Yes, it’s old news, but I never thought to look for it online before and I’m glad I finally did. When this was on TV, the sound quality was all over the place but in this version you can hear what the dealer is saying to him (just try to ignore the DIY Tarantino soundrack). Sky One had to rush to get the program out on time. It was meant to be live from the Hard Rock, but they changed their mind about accepting the bet and in the end the Plaza stepped up but it wasn’t allowed to be broadcast live. For a bet of this size, I think they have every right to be paranoid. The rule that the bet must to be placed before the ball has travelled twice around the wheel is to eliminate the use of any computer devices that can calculate where the ball will land from its speed. Even so, such a device is only accurate in predicting a segment of the wheel (its users have to know the arrangement of numbers on the roulette wheel and bet accordingly) so it’s unlikely to be significant on a red/black bet. The Plaza still have a sign on the "lucky" table to commemorate their huge loss. As my Poker Tracker is shafted (it actually ran out of disk space before Christmas and broke the PostgreSQL database, and I still haven’t fixed it) I set up Poker Office to play this bonus, which I haven’t used in a long time and had forgotten just how good it was. I particularly like one of the features for multitabling: showing player actions. Poker Tracker doesn’t have this. The overlay projects a series of letters next to each player with C, R or X for whether they called, raised or checked on each betting round. If you’re involved with two hands at the same time and can’t quite remember who raised pre-flop this can be very useful. Last weekend, Sporting Index threw a bonus deal at me because I hadn’t given them any action for atout 2 years. It was effectively free money. I had to deposit to play, but they would refund any losses up to £50 over the course of the weekend. This was a refund of net losess, not on a single bet. As they offer spread betting not fixed odds, taking full advantage of their generosity is a little trickier. I hadn’t planned it that well last weekend and ran out of time before I could get one more bet before the deadline in whilst I’d still not lost the full £50. In fact, on my last bet I committed a cardinal sin – I had ended up with a winning bet, but the only result of that was that I won back some of the money they were going to repay me anyway – not enough to take home a profit! With this kind of promotion, the last bet you place should always make you busto (within the limits of the refund value) or guarantee a profit. With sports spread betting, I found this tricky to anticipate with my hurriedly placed total goals and corners bets. The key would be to find a bet that has a limited downside so you can’t lose more than £50, but also has the chance of hitting it big. A total goals bet on soccer, buying at 2.5 goals for £20 per goal cannot lose more than £50 (for a 0-0 draw) but a three goal match only wins you £10 – you need to find a real goalfest to win a significant amount. This weekend’s promotion is available to everyone, and is in a similar vein – a £30 net refund from your weekend’s bets, but for their virtual games rather than sports spread betting. These games are gimmicky rubbish, allowing you to bet on fake horseracing, fake poker games, fake dice, fake slots and fake roulette as well as some really silly novelty games like a cartoon tank that fires footballs with random numbers into the air. However I liked the look of the roulette game in order to play through this offer fairly easily so I had a go. It’s a single zero game and you create your own market by placing chips as you would in a casino, and then betting higher or lower than an expected win amount that the system generates for you. To keep things simple, I only looked at single unit bets and for every type of bet the market was set at 0.94-1.00. In other words, when you buy the market at 1.00, the amount you win is exactly the same as you would win on a regular roulette table. A single number still wins 36 times your stake and a red/black bet wins even money. The house edge for each bet comes only from the zero on the wheel – 1 in 37, or just over 2.7% - just as it does in a casino. The 0.94 figure is for when you want to bet against the spin producing a winner for whatever bet you placed on the roulette layout. When you sell this market, you can win 0.94 times your stake but you risk the amount of the roulette payoff multiplied by your stake. Betting against a single number, you could win 94p or lose £36 for a £1 stake whereas on an even money bet, you are laying £1 to win 94p. The zero on the wheel works in your favour - you win 19 times out of 37, but the payoff is reduced. If my calculations are correct, the edge on selling bet is very small. For a red/black bet at £1, every 37 spins you will lose (18 x 100) and win (19 x 94), a net loss of 14p. That’s a house edge of 0.38%! I’d love someone (if only I knew a maths teacher, for instance…) to correct me here – that seems far too small, and I wish I’d noticed this before I actually started playing out this bonus! I had also assumed that I would have to buy in any market in order to hit a big payoff. Now I realise this is also not true. I would have been able to cover multiple bets on the layout (e.g. two separate dozens) and sell that market for odds of roughly 2-1. Effectively I’d be betting the other dozen as well as the zero, and this might have been a better bet than doing the bet the "normal" way round. Down to £12. I’d need a 2-1 payoff to get back to be only £6 into profit. It would have to be a 5-1 shot or longer to make it worthwhile. I decided to play it a different way – try to gamble back up to the free £30 and then go for one win for that full amount on a 2-1, aiming for a £60 profit. I bet the first dozen for £30. If I win, it’s £60 profit and I’m cashing out. If I lose, I get my £30 back on Monday. A great position to be in.